The differences stem from whether the physical files are ‘zereod’ or not (ie where there is no data in the ‘virtual’ disk what in the underlying VMDK?). Several features (such as FT and MSCS) require an ‘eagerzeroedthick’ disk. Check out this great diagram (courtesy of Steve Foskett) which shows the differences. 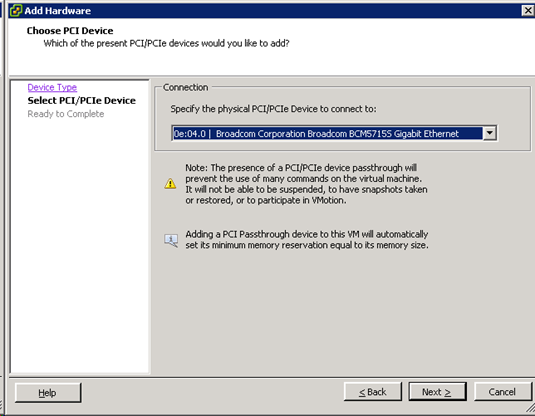 Configure PCI device at host level (Configuration -> Advanced Settings under Hardware). 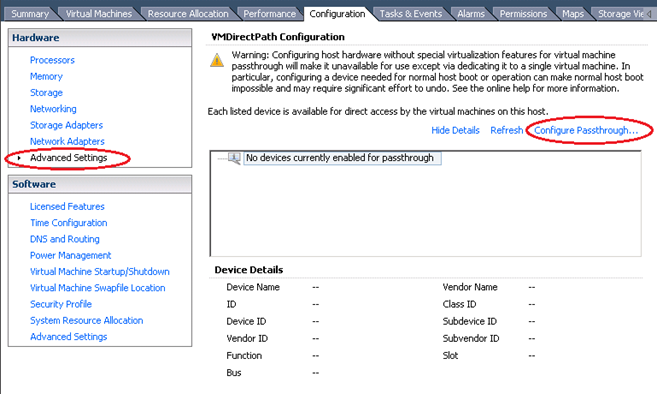 Click ‘Configure Passthrough’ and select a device from the list. NOTE: If the host doesn’t support DirectPath a message to that effect will be shown in the display window. 1. 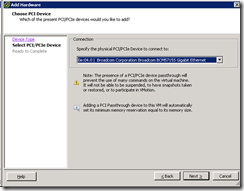 Edit the VM settings and add a PCI Device. NOTE: The VM must be powered off. 2. 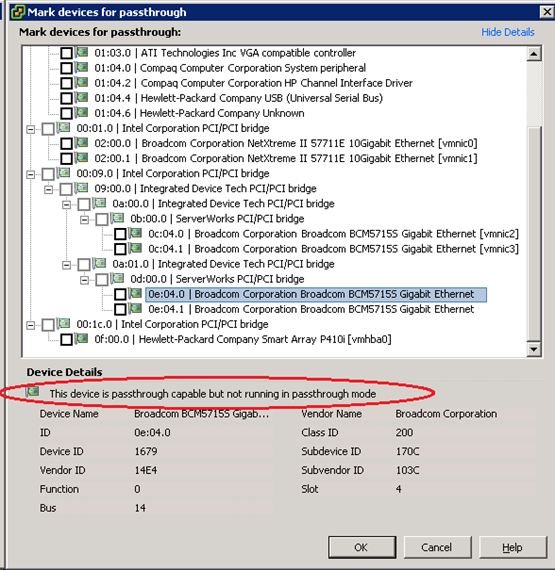 Select the passthrough device from the list (which only shows enabled devices). There is a warning that enabling this device will limit features such as snapshots and vMotion). If you want in-depth information about VMDirectPath read this VMware whitepaper. According to the ESXi Configuration Guide adding a VMDirectPath device to a VM sets it’s memory reservation to the size of allocated memory but I forgot to confirm it in my lab (see p62). Stands for N-Port ID Virtualisation. This allows a single HBA adaptor port (provided it supports NPIV) to register multiple WWPN’s with the SAN fabric, rather than the single address normally registered. You can then present one of these WWPN’s directly to a VM, thus allowing you to zone storage to a specific VM rather than a host (which is normally the only option). Read more in Scott Lowe’s blogpost, Jason Boche’s (in depth) blogpost, Simon Long’s post, and Nick Triantos’ summary. They left me wondering what the real world benefit is to VI admins! 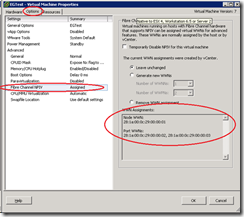 In the VM properties, to go Options -> NPIV. 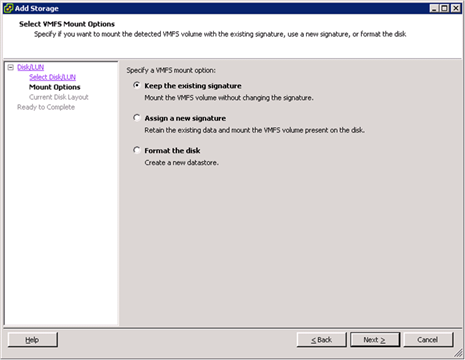 NOTE: These options will only be enabled if the VM has an RDM attached. 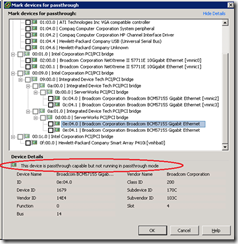 Even if enabled it does not guarantee that the HBA/switches support NPIV. 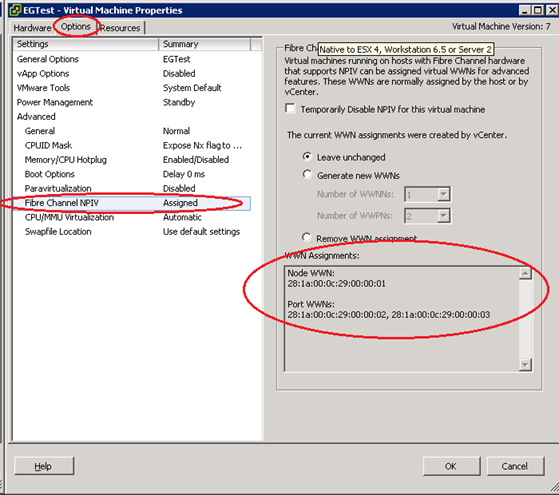 You’ll also have to add the newly generated WWPN’s to your SAN zones and storage array masking (Initiator groups in the case of Netapp). HBAs and SAN switches must support NPIV. Joep Piscaer has written up a good summary of RDMs, and from that article –“RDM’s gives you some of the advantages of direct access to a physical device while keeping some advantages of a virtual disk in VMFS. As a result, they merge VMFS manageability with raw device access”. Anytime you want to use underlying storage array features (such as snapshots). Some SAN management software needs direct access to the underlying storage such as Netapp’s SnapManager suite for Exchange and SQL. Physical compatibility. Passes through almost all SCSI commands, no snapshots. NOTE: When cloning a VM with RDM’s (in virtual compatibility mode) they will be converted to VMDKs. 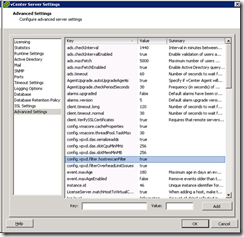 Cloning a VM with an RDM in physical compatibility mode is not supported. 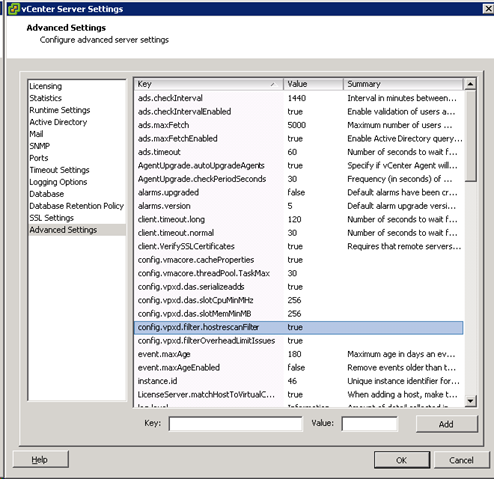 Storage filters are used to adjust default vCenter behaviour when scanning storage. See this post about storage filters at Duncan Epping’s site. Add a key for the filter you want to enable and set the key to FALSE or TRUE. NOTE: All filters are enabled by default (value is TRUE) even if not specifically listed. Turning off the ‘Host Rescan’ filter does NOT stop newly created LUNs being automatically scanned for – it simply stops each host automatically scanning when newly created VMFS Datastores are added on another host. This is useful when you’re adding a large number of VMFS Datastores in one go (200 via PowerCLI for example) and you want to complete the addition before rescanning all hosts in a cluster (otherwise each host could perform 200 rescans). See p50 of the FC SAN Configuration Guide. One occasion where a VMFS filter might be useful is extending a VMFS volume. With vSphere this is now supported but I’ve had intermittent success when expanding a LUN presented by a Netapp array. The LUN (and underlying volume) has been resized OK but when I try to extend the VMFS no valid LUNs are presented. Next time this happens I can try turning off the storage filters (VMFS in particular) and see if maybe the new space isn’t visible to all hosts that share the VMFS Datastore. LUN Resignaturing is used when you present a copy of a LUN to an ESX host, typically created via a storage array snapshot. Been around since VI3 but ease of use has increased since. NOTE: This doesn’t apply to NFS datastores as they don’t embed a UUID in the metadata. Click Add Storage on a host and select the LUN copy. Keep existing signature. This can only be done if the original VMFS Datastore is offline or unavailable to this host (you’re trying to mount a mirrored volume at a DR site for example). NOTE: If you try and the other VMFS Datatstore is accessible you’ll get an error stating that the host configuration change was not possible and the new datastore won’t be mounted. 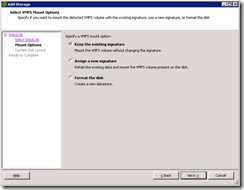 Assign a new signature (data is retained). This is persistent and irreversible. Format the disk. This assigns a new signature but any existing data IS LOST. ‘esxcfg-volume –M <previous VMFS label | UUID> to mount the volume without resignaturing (use lower case m for temporary mount rather than persistent). This can be done in various ways (Netapp implement LUN Masking through the use of Initiator Groups) but for the VCAP-DCA they’re referring to PSA rules (ie at the VMkernel). For a good overview of both why you might want to do this at the hypervisor layer (and how) see this blogpost at Punching Clouds. NOTE: The device ID above is the ‘naa’ code for the LUN. Find it using esxcfg-scsidevs –-vmfs. Verify that the LUN/datastore is no longer visible to the host. This is a pretty convoluted procedure which I hope I don’t have to remember in the exam! VMwareKB1009449 describes this process in detail and it’s also documented on p82 of the FC SAN Configuration Guide and p96 of the Command Line Interface Installation and Reference Guide (both of which should be available during the exam). Obviously if you want to mask a LUN from all the hosts in a cluster you’d have to run these commands on every host. William Lam’s done a useful post about automating esxcli. There’s also an online reference to the esxcli command line.